Kitty Kelley reported that "Nancy and Sinatra began having an affair when her husband was Governor of California and 'continued for years.' 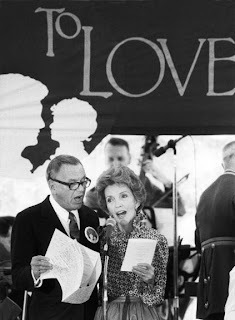 As First Lady, Kelley writes, Nancy entertained Sinatra at the White House, which he entered 'in the back way,' for three-or four-hour 'private 'luncheons' in the family quarters. When Nancy was with him, Kelley quotes a staffer as saying, 'She was not to be disturbed. For anything. And that included a call from the President himself.'"